The SARTANG community celebrated TANG festival in Salari village, APLA speaker Thongdok, Dirang MLA Phurpa Tsering took part in the festival. Like many other festivals of different race and tribes, “The Tang Festival” is one of the most important ritual of the Sartang Community of West Kameng district. “Tang” refers to the omnipresent Almighty god , who is the giver and provider of all the happiness and grief as well. Every Tribe has thei r own belief, faith and theory of their origin. As per Sartang mythology and belief , they migratd from the eastern part of the great Himalayas . Their forefather “Ashu Zeng Zeng” migrated from “SRI THANGLI” ( Mount Gorichen ) and settled here with his wife ” AYA NGOIUZHUNG” . ASHA ZENG ZENG , AYA NGOIZHUNG had four sons. 1- Rongra -Dingla, 2- Mijen-Mina, 3-Jeri-Jeson and Thonso Bruson . During the early period of their settlement , the brothers faced a lot of problems, famines and epidemic. They sought the advice of their father , who advised them to worship Almighty Omnipresent TANG to overcome theri problems and difficulties. Heading thr advice of their father , they started praying the omnipresent TANG , who bestowed upon them Bounty-full harvest and also protected them from femines and disease . In return the Sartags made offering to TANG, to thank for the Harvest, Peace and Prosperity and also to appease TANG to keepaway the bad spirits, ward away the bad omens and to protect them. This harmonious relationship between TANG and the SARTANGs, the provider and the reciver , The protector and the protected have sicne continued ans is practiced till today. 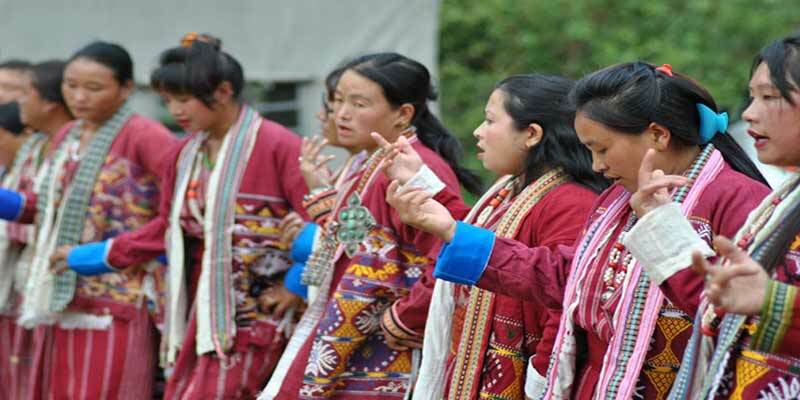 The TANG is celebrated at every major village of the Sartang area with a lot of festivity and fervour. This being the major and most important ritual, a lot of consultation takes places anongst the villagers. The village head and the head priest ( Bullu Chabji). The TANG festival is a most important festival of the Sartang community. Hence it is celebrated during the season of pre harvesting period. Presviously , the system of celebration was not organised in systemic way . It was observe on different dates in diferent villages of Sartang area with change in the outlook and perceptions of the common platform is to be made for centrally celebration of the festivals. Accordingly the people of the Satrang community decided that the 15th September of every year would be sacred day of TANG Festival. Seven days before the commencement of actual puja the head man of he society along with the priest get together to select an expert and experience priest to be the interpreter between the god and hunab beings. Preparation of PHAK ( Maize bear ) , ARA ( filtered local Wine ) , Noho ( smoked fish ) etc are arranged for ritual purpose and also for guests. The TANG festival started with the prayer of head priest along with hoisting of white flag centrally marking the logo of the society with much spirit and delight. During the perod of celebration of TANG festival people come out in the morining in the best of their traditional attires at saloum ( festival spot ) . The priest chabji and Romu performing puja to seek blessing from alimighty god. In the last day of the festival the bull is free up for life time with the prayers by Bullu chabji after tie up a holy thread made up of sheep wool. After the performance of ritual community fest is serve to the guest and people present inthe festival. In the evening various culture items are held and huge marry making take place amongst the people irrespective of race.